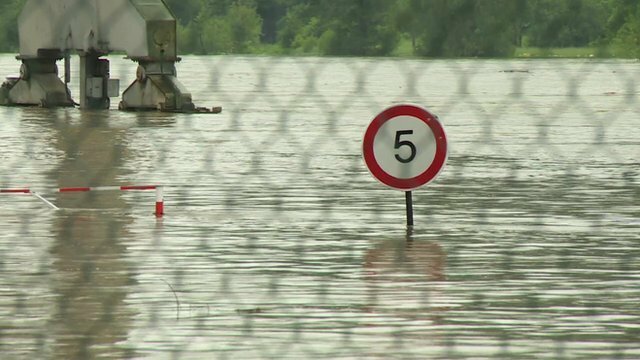 Home Tags Posts tagged with "river vltava"
Southern and eastern German cities are on high alert as heavy floodwaters swell rivers including the Elbe. In Halle, an appeal has gone out to residents to help reinforce flood defenses while Dresden is preparing for water levels 5 m higher than normal. 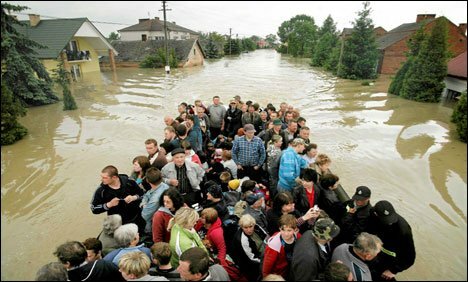 German Chancellor Angela Merkel has promised 100 million euros ($130 million) in emergency aid for flood-hit areas. However, Prague’s flood defenses appear to have held, and the risk of severe flooding in the city centre seems to be receding. She promised 100 million euros in immediate aid, of which 50 million euros will go to Bavaria. In the Czech Republic, a nationwide state of emergency is still in force. Water levels are expected to peak in the north later on Tuesday. As a precaution, Prague’s metro system and central sewage treatment plant were closed, metal flood defenses were erected and sandbags built up along the banks of the Vltava. The Charles Bridge – normally packed with tourists – was shut and tigers at the city’s zoo were tranquilized and moved out of an enclosure thought to be at risk. A system of nine dams called the Vltava Cascade was found to be dangerously full, and the floodgates were opened at 20:00 local time on Monday night. North of Prague, further downstream, the River Elbe is rising to levels approaching those seen in 2002, the last time Europe experienced similar floods. Seventeen people were killed in the Czech Republic in August 2002 and the cost of the damage across the continent was estimated at 20 billion euros ($26 billion). In Austria, the meteorological service said two months of rain had fallen in just two days. Hundreds of homes have been evacuated across southern Germany, the Czech Republic, Austria and Switzerland as rivers reach dangerously high levels. The Czech capital Prague is on high alert as a swell of floodwater moves in from the south. Both Germany and Austria are deploying their armies to help emergency services. A man was killed by a landslide near Salzburg in Austria and two people have died in the Czech Republic. The Czech government has declared a nationwide state of emergency. The Czech deaths came after floodwaters destroyed flimsy country cottages. Two more people are missing in the country after their raft overturned on a swollen river. Firemen in Czech Republic capital have been putting up metal flood barriers and volunteers filling sandbags as the River Vltava is due to reach peak levels in Prague some time on Monday morning. Czech PM Petr Necas has called a special cabinet session to co-ordinate the emergency response. Authorities believe the river in Prague will not reach the levels it did in 2002, when parts of the city were devastated, but will still be high enough to cause severe damage. 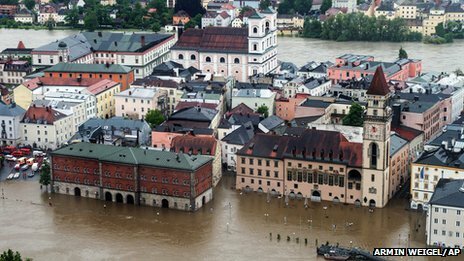 Bavaria’s flood alert service warns that the forecast of continuing heavy rain is likely to worsen the flooding affecting the Danube and the Inn, among other rivers in the area. The German cities of Passau and Rosenheim have declared a state of emergency. Authorities in Passau, which lies at the confluence of three rivers in Bavaria, say they expect the Danube to reach 10.5m by Sunday evening and have requested help from the German army. Bavaria is not the only German state to be affected; towns and cities in Saxony, Thuringia and Baden-Wuerttemberg are also inundated. The Munich-based newspaper Sueddeutsche Zeitung reports that the German army is to be deployed in Bavaria, Saxony and Thuringia to support the flood-affected areas. German Chancellor Angela Merkel has discussed the floods in phone calls with the premiers of Bavaria and Saxony, the paper says. Near the Austrian city of Salzburg a man was found dead after being swept away as he worked to clear a landslip. Two further people are missing in the Salzburg area, according to Austrian media. A third is missing in Vorarlberg. The Austrian army was called in to help civil authorities in the settlement of Taxenbach, south of Salzburg. Their main task was to clear landslides and make roads passable. Parts of the Pinzgau region, which includes Taxenbach, have been declared a disaster zone.